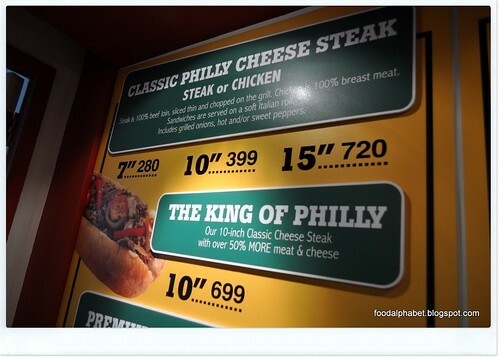 The Food Alphabet and More: One fine Philly Cheese Steak!!! Just look at the sight of that! 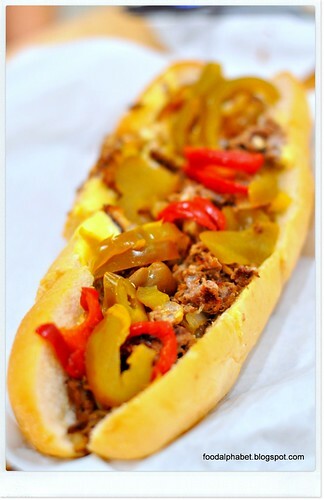 Yes, you said it right PHILLY CHEESE STEAK!!!! 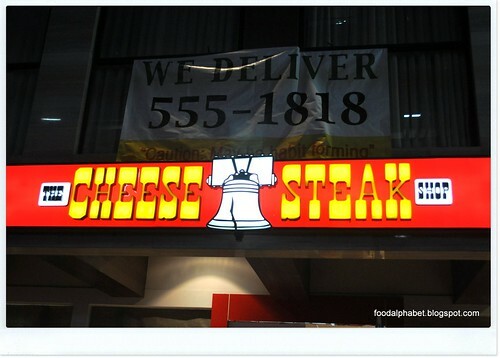 Finally original Philadelphia Style Philly cheese steak arrives on Philippine shores. Whatever they look, however they are made nothing gives you that satisfaction that only a Philly Cheese steak does. 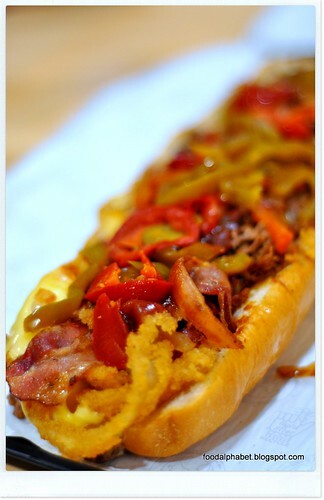 The Cheese Steak Shop, the first in the Philippines, traces its roots in Northern California that makes the tasty original Philadelphia style cheese steak sandwich, combining the mouth watering taste of prime cut beef, oozing with juices overflowing with grilled onions and cheese packed on 7", 10" or 15" rolls, topped with hot and sweet peppers to add flavor to every bite. 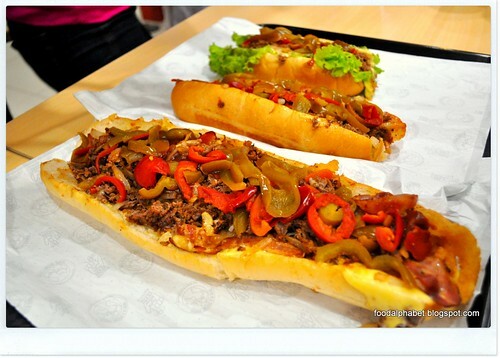 Get the classic Philly Cheese Steak 7" at P280, 10" at P399, and 15" at P720. More choices with premium cheese steaks such as Bacon, Mushroom, De Luxe, Pepperoni, Spinach and Western at P320, P520 and P850 by inches. Add more spice with Pizza, Garlic, Barbeque and Hoagie variants at P300, P485 and P750 by inches. But of course you can always customize your cheese steak and put in more toppings of your liking with choices such as garlic, tomato, spinach, lettuce, onions and a whole lot more! 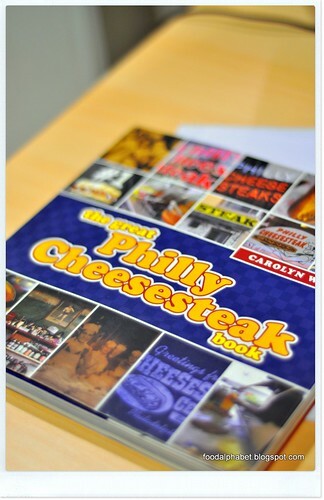 Aside from their famous Philly Cheese Steaks, match it up value meals at P110 for regular and P150 for large. 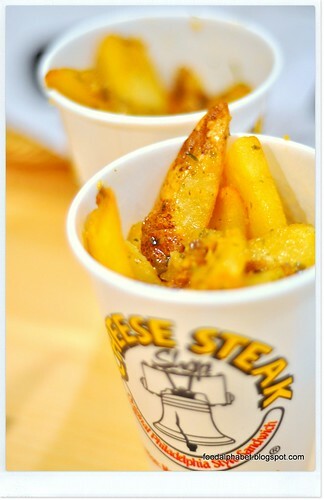 With choices of steak fries, garlic fries and twister fries. 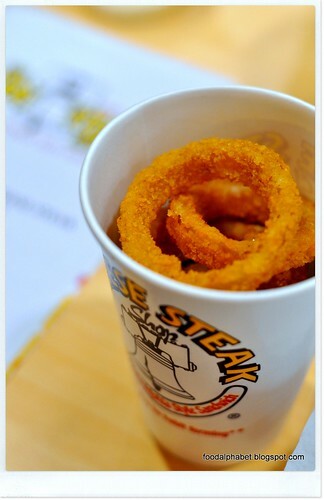 And they have onion rings as well. Salads and specialty sandwiches and Buffalo wings complete the line-up of food offerings. What makes these Philly Cheese Steaks so unbelievably delicious? 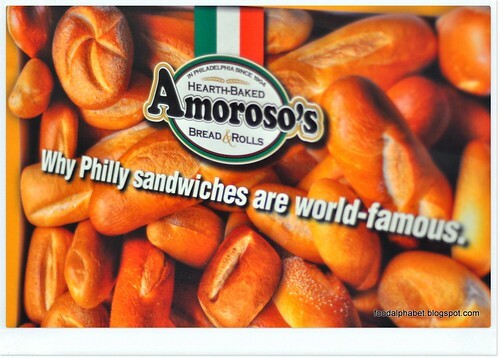 Other than their delicious filling and tons of toppings of course Amoroso's bread rolls, that is why Philly sandwiches are world famous! They are the perfect match to bite into your cheese steaks. Almost 90% of all foods from The Cheese Steak Factory are imported from the source so that you can experience it just like you were there. The Cheese Steak shop is adorned with everything Philadelphia, giving you that same feeling as if you are in the USA stores, along with the guidance of Ms. Carolyn Wyman, author of The Great Philly Cheese Steak Book, every details has been looked upon and certified to be that same Great Philly Cheese steak the world has known over. Heed the warning! 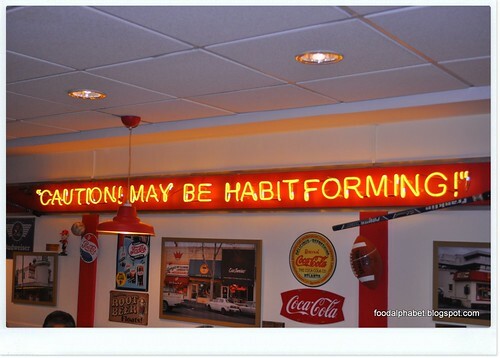 It is indeed habit forming! 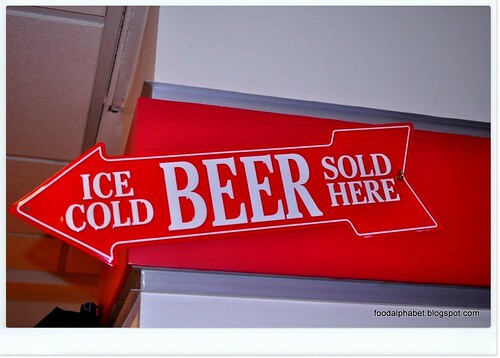 Yup, they serve cold beers from local to imported ones. 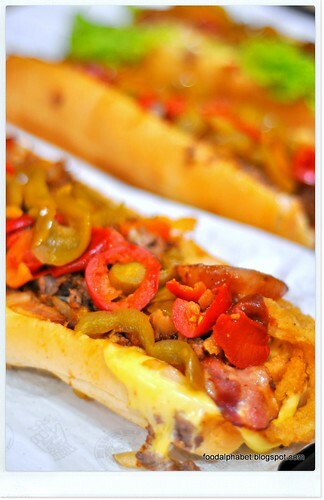 Admittedly Philly cheese steak sandwiches are indeed a perfect beer-match, spend barkada nights here and enjoy! 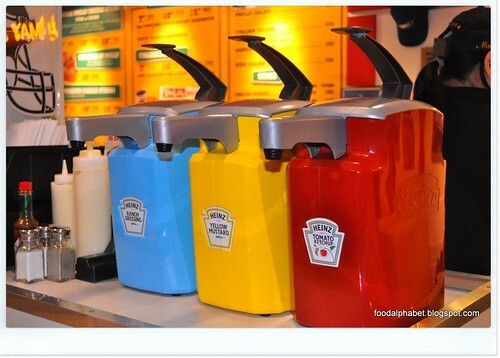 Just look at those big canisters of Heinz Tomato catsup, Yellow mustard and Ranch sauces, I just love them! Don't bother asking if they are for sale, they're not but I would just love to have one of those at home, wouldn't you? So enjoy the complete line-up of sandwiches that are being offered in the US, here on our own shores, and immerse yourselves with the Classic Philly Cheese Steak, the King of Philly, 10 premium cheese steak sandwiches, original vegetarian and Zesty vegetarian sandwiches as the top of the line Italian Hoagie. 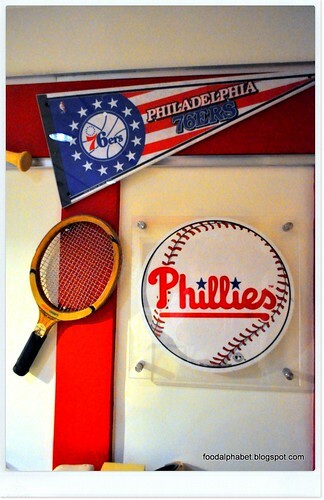 Let's munch on our cheese steaks at The Cheese Steak Shop, drink some booze and enjoy the good life! WOW! that philly cheesesteak sandwich has my attention! I get so hungry every time I see photos from this place! AGH! Thank you for taking notice with regards to Chrome, I already have fixed the issue as it is a link that is giving out that malware warning.